A global pharmaceutical company was developing a large molecule drug for a gastroenterology indication and wanted to set up an automated process for assembling pre-filled syringes without compromising container integrity. 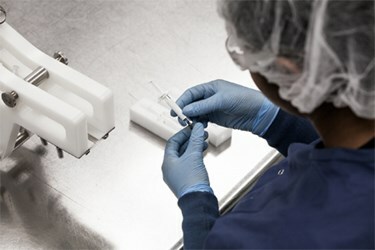 Working closely with Fisher Clinical Services, the company selected the syringe components then devised eight different configurations that needed to be evaluated for the clinical trial. These options included minimum and maximum fill volumes, two syringe formats – 1 ml and 2.25 ml – and different materials for the plunger rod, stopper, and needle safety device. The company predicted several thous and syringes would be needed monthly.